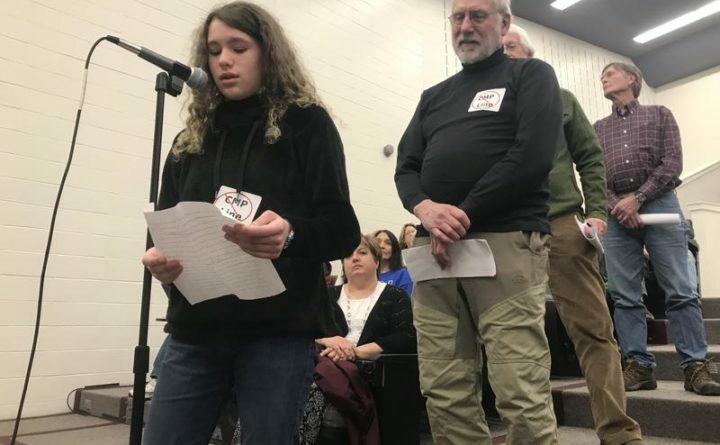 Helena Kelley, 11, of Portland, speaks out against the CMP project at a public hearing Wednesday night in Farmington. State environmental regulators took public testimony last night on Central Maine Power’s proposed 145-mile transmission line through western Maine, including 53 miles of newly cleared corridor through the western Maine forest. More than 300 people attended the hearing at the University of Maine’s Farmington campus. Project opponents turned out in force, but a number of supporters spoke as well. Under a contract with Massachusetts utilities, the project would bring renewable energy from Canadian dams into this region’s electricity grid. Christopher Ayres of Pownal, who described himself as an avid outdoorsman and photographer, said he favors the project because it represents a significant down payment on the urgent need to reduce greenhouse gas emissions. “Already in my backyard, on the coast of Maine and around Baxter Park, which I routinely visit, I see first-hand undeniable changes in bird migration patterns and their food sources, such as insects. It is clear to me that global climate change is the existential crisis of our time,” he said. But many see the project itself as the imminent threat. Daryl Wood of New Sharon said he often visits the area where the new powerline would be constructed to hunt, snowmobile and fish what is the nation’s largest population of native brook trout. The state’s Land Use Planning Commission and the Department of Environmental Protection are trying to determine the reasonableness of the project’s potential effects on habitat, water resources, scenic values and potential mitigation — and whether there is a reasonable alternative. Those who wish to testify at the environmental hearing in Farmington on the CMP transmission line project are sworn in. Some called for the line to be buried, or placed closer to existing roads. Suzanne Theberge of Jay read a statement on behalf of Peter Theberge, taking aim at the powerful interests and governments behind the project, including CMP’s owner, Spain-based Iberdrola. Several project supporters urged the panel to accept the environmental value of the low-polluting hydro-electricity from Canada as vital to slowing climate change. And Kimberly Lindlof, director of the mid-Maine Chamber of Commerce said that was part of protecting the region’s economy. 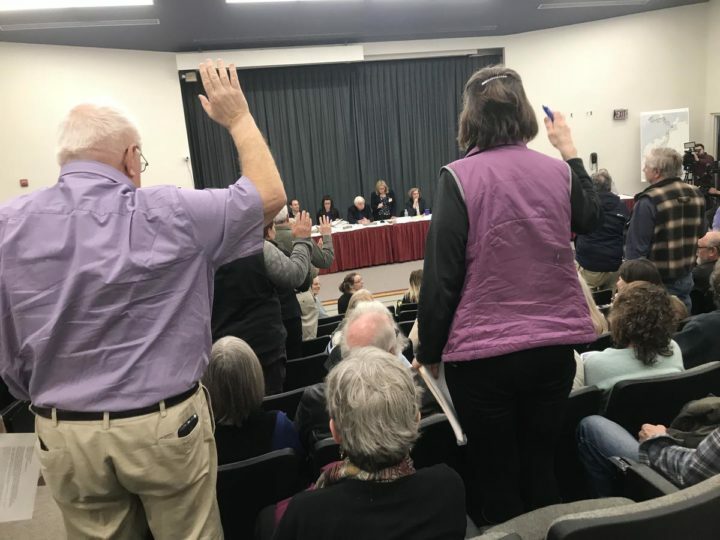 The hearings continue through the end of the week, with another for the general public scheduled for Thursday at 6 p.m. at the University of Maine Farmington.